PORT AU PRINCE, Haiti, Nov 16, CMC – A warrant has been issued for the arrest of former tourism minister tourism minister Edouard Junior less than a month after he claimed he was being politically persecuted and prevented from leaving the country. 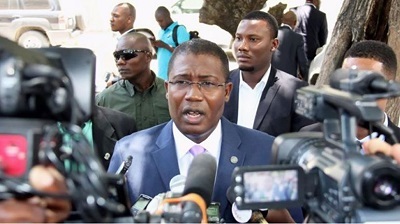 According to the warrant issued by Clame Ocnam Daméus, the Government Commissioner at the Court of First Instance in Port-au-Prince, the former minister is accused of “embezzlement of public property and attempted embezzlement of public goods…”. Last month, Junior told radio listeners that unknown gunmen had fired shots at his home and that he had also received death threats. “From now on, my safety and that of my family are in the hands of (President) Jovenel Moïse..,” said Junior, who served in the 2016-17 administrations of former president Jocelerme Privert and former prime minister Enex Jean-Charles. In October, Daméus, as part of the preliminary investigation sent a letter to the Director of the Immigration and Emigration Service asking him formally to “pass the necessary instructions” so that Junior and former economy minister Yves Romain Bastien be prohibited from leaving the country by air, sea and land.